If you start reading the Bible in Genesis, it shouldn’t be too long before you realize the significance of God’s words. Consider the creation of the world in Genesis 1. Notice how many times “And God said…” or “God called..,” appears. God created everything ex nihilo by speaking words. Consider how God established His people, Israel – by words (Genesis 12). Consider how He instructed His people in all manners of life – by words, the Law. (Exodus 20-40, Leviticus, Deuteronomy). Consider why God judged His people – for failing to obey His Word (The Prophets). Consider how highly the LORD esteems His word (Psalm 138:2). Consider Jesus Christ, the Logos (John 1:1-3, Luke 24:27). Consider how the church is formed – by proclaiming the gospel (Matthew 18:13-19; 28:19, 1 Cor. 1:18-25). Consider how the Word instructs and protects God’s people from error (Psalm 119:11, 2 Timothy 3:10-17; 4:1-5). From this very small sampling of Scripture, it should seem obvious how important the Word of God is for His people. Why? Because the Word of God reflects and reveals God and shapes God’s people that we might be conformed to the image of Christ. God’s people were predestined to reflect His glory (Ephesians 3:10-11). When the church fails to submit to God’s Word, corporately and individually, it becomes ripe for discipline. However, the greater offense is the marring of God’s image and reputation in the world. We ought to learn from OT Israel what defaming His name entailed. Thabiti Anyabwile wrote a thoughtful article about the effects of neglecting the Word, particularly but not exclusively, in the African American church. May we take heed, lest we fall. The reason why we don’t go to God for joy and pleasure is because we don’t perceive Him as the incomparable majestic holy being that He is. Therefore, we really don’t know Him as we should. We have other loves. We have other loves of infinitely lesser value. We have a greater affection for our other loves. We simply desire God too little. We need greater affection for God. I believe this comes by studying and meditating on Him as revealed in the Scriptures. I believe right theology leads to passionate doxology. We need a greater sense of awe concerning God. We first must understand who God is. 2. God’s absolute being means God will never end. If he did not come into being, he cannot go out of being because he is being. He is what is. There is no place to go outside of being. There is only he. Before he creates, that’s all that is: God. 3. God’s absolute being means God is absolute reality. There is no reality before him. There is no reality outside of him unless he wills it and makes it. He is not one of many realities before he creates. He is simply there as absolute reality. He is all that was eternally. No space, no universe, no emptiness. Only God. Absolutely there. Absolutely all. 4. God’s absolute being means that God is utterly independent. He depends on nothing to bring him into being or support him or counsel him or make him what he is. That is what the words “absolute being” mean. 5. God’s absolute being means rather that everything that is not God depends totally on God. All that is not God is secondary, and dependent. The entire universe is utterly secondary. Not primary. It came into being by God and stays in being moment by moment on God’s decision to keep it in being. 6. God’s absolute being means all the universe is by comparison to God as nothing. Contingent, dependent reality is to absolute, independent reality as a shadow to substance. As an echo to a thunderclap. As a bubble to the ocean. All that we see, all that we are amazed by in the world and in the galaxies, is, compared to God, as nothing. “All the nations are as nothing before him, they are accounted by him as less than nothing and emptiness” (Isaiah 40:17). 8. God’s absolute being means that he is the absolute standard of truth and goodness and beauty. There is no law-book to which he looks to know what is right. No almanac to establish facts. No guild to determine what is excellent or beautiful. He himself is the standard of what is right, what is true, what is beautiful. 9. God’s absolute being means God does whatever he pleases and it is always right and always beautiful and always in accord with truth. There are no constraints on him from outside him that could hinder him in doing anything he pleases. All reality that is outside of him he created and designed and governs as the absolute reality. So he is utterly free from any constraints that don’t originate from the counsel of his own will. Meditate on these ten realities. They are profound and they are biblical. These reasons, and there are infinitely more, ought to cause us to consider how great God is. There is no one or nothing more truthful and exhilarating than God! At the onset, one might reply to this question with a hearty, “Yes! !” However, some are more inclined to be less controversial, for the sake of peace, and rather pray for the repentance of false teachers than shedding light on their teachings. 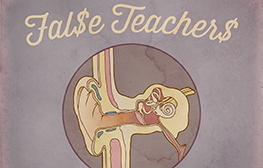 We should definitely pray for false teachers to repent, but more should be and must be done. While casting light on false teachers is often seen as a divisive and unloving move, it actually is the opposite. Exposing false teachers strengthens the unity of the church and is a great act of love. Sound perplexing? If it does, stay with me and I’ll explain my statements more fully. Christian rapper/emcee, shai linne, recently released his 5th solo album, Lyrical Theology, Part 1: Theology (the first of a trilogy), which included what has become a controversial song, Fal$e Teacher$. The song has become controversial because shai linne names some of the prominent proponents of the prosperity gospel. The false teachers shai names are T.D. Jakes, Benny Hinn, Kenneth Copeland, Creflo Dollar, Eddie Long, Joel Osteen, Fred Price, Robert Tilton, Juanita Bynum, Joyce Meyer and Paula White. Knowing the song would elicit controversy, shai wisely prepared and made public an explanation of his motive for making the song before the song was officially released. To many people’s surprise, shai received a response from Brad Knight, Paula White’s son and shai offered a gracious, yet firm, reply. Exposing false teachers is something I began doing a couple years after my salvation and still do. Like shai, I was met with criticism and misunderstanding and I was outright accused of being a slanderer and unloving….by other Christians! So like any other Christian who believes in the authority and inerrancy of God’s Word, I offered Scripture to justify my position of being aware of and naming false teachers. In turn, they offered Scripture to justify their positions to NOT name false teachers. Are the Scriptures divided? Does the Bible truly contradict itself? Can we use Scripture to argue away Scripture? To this absurd question, I offer the urban idiom, “Come on, son!” We must read Scripture correctly to know how to apply it to our lives by God’s grace. Recently, I found myself in a discussion similar to ones I’ve previously had concerning the notion of exposing false teachers. I sent shai’s song to a few people for thoughts and one person expressed very little about the song and offered a few verses for me to think about. Those verses were Matthew 7:1-2, 2 Timothy 2:14-16, and James 4:11. A casual reading of these verses communicated to me that the other person thought the song was divisive and unloving. I read those verses in context and offered my thoughts to that person about whether or not those verses were used correctly as justification to NOT expose false teachers. I am posting my thoughts here not to gloat or embarrass anyone, but rather to show how essential it is that we learn how to interpret the Scriptures so that we can be more responsible and faithful Christians. This command comes toward the end of His discourse commonly known as The Sermon on the Mount (Matthew 5-7). The essence of His sermon is to reveal what life looks like for those who are of the Kingdom of God. Chapter 5:1 reveals to whom Jesus was speaking – the crowds and His disciples. In fact, the end of Matthew 4, verses 23-25, convey that Jesus was speaking to large crowds in various places. Matthew 7:1-2 has commonly been used to try to dissuade people from judging. However, these verses are not about judging (being discerning), but rather about hypercritical judgmentalism, which stems from the root of the sin of pride. Jesus is not commanding us to not use good judgment or not to be discerning, but rather not to be pridefully judgmental. Christians are called to judge or use discernment primarily to understand the ploys of Satan and to know how to apply the Word. Ironically, a few verses down in Matthew 7, verses 15-20, Jesus commanded His listeners to “beware of false prophets who come in sheep’s clothing, but inwardly they are ravenous wolves.” That’s a bold statement by Jesus Himself. Is He being judgmental by calling people false prophets and ravenous wolves? Certainly Jesus isn’t contradicting Himself, right? We might wonder why Jesus warned people about false prophets? Why did He feel the need to sound the alarm? I think it’s because He loved people and cared for them and didn’t want them to be led astray by destructive teaching. This letter is known as a pastoral epistle and it was Paul’s instructions to Timothy as he pastored the church in Ephesus. Between the two letters addressed to Timothy, Paul encouraged Timothy to be bold, preach the gospel, defend it against error, how to structure the church, the qualifications of church leaders, and how to encourage the believers in their actions toward one another. You mentioned 2:14-16, but I first want to direct you to 1:13-14. Paul tells Timothy to follow the pattern of sound words (doctrine) and to guard the good deposit that was entrusted to him. That deposit is the gospel; ironically the same gospel that Paul was in prison for preaching. Looking at 2:14-16, we need to again look at the context. If you start at 2:1 and read to verse 13, you’ll see that Paul is exhorting Timothy to disciple men who will in turn disciple other men (v1-2). Paul says, “…what you heard from me in the presence of many witnesses, entrust to faithful men..” What Timothy heard from Paul was the gospel, which we see in 1:13. However, 2:8 is ample evidence of what Timothy heard from Paul because he says, “Remember Jesus Christ…” Verse 14 starts off with “Remind them of these things…” What things does Paul want Timothy to remind the men of? The things mentioned in 2:6-13 – things about Jesus. Why do you think Paul exhorted Timothy to rightly handle the word of truth (2:15), to guard the gospel (1:14) and to remind the men Timothy would mentor to remember the truths of the gospel (2:14)? Jude is exhorting the reader to contend for the faith and he qualifies false teachers as being headed for condemnation for perverting the gospel. These false teachers were not teaching what was in accordance to sound doctrine. That’s pretty strong biblical language! But perhaps what’s more revealing is what Paul continued to write in 2 Timothy 2 in verses 16-18. Paul tells Timothy to tell the men to avoid irreverent babble because it will lead people astray into ungodliness and he mentions two men by name who were guilty of babbling irreverently: Hymaneus and Philetus. Paul says they swerved from the truth and upset the faith of some for teaching false things about the resurrection (2:18). Do you see what Paul is doing? He is not only instructing Timothy how to instruct other men concerning false teaching, but he is outright calling Hymaneus and Philetus false teachers. Why does Paul speak like this? I think it’s for the same reasons Jesus warned people – because he loved them and didn’t want to see them troubled by false teachings concerning Christ. So considering the context of this letter, 2 Timothy 2:14-16 is not a biblical defense to not expose false teachers. In fact, it does the opposite. The epistle of James was written to various Jewish Christians who were scattered due to persecution (1:1). James is an interesting letter because it addresses many different things that seem to not be connected. Some have termed the epistle of James as Proverbs of the New Testament. It’s an epistle filled with practical wisdom for Christians because of what the gospel had accomplished in their lives. When I looked at 4:11, it appeared to be a summarized re-statement of the issues James mentions in 3:1-4:10: taming the tongue, what godliness or wisdom from above looks like, and the nature of fights and quarrels. What James is essentially calling our attention to is harmony and unity within the body of Christ and what kinds of heart attitudes and behaviors that disrupt that harmony. So he summarizes it all by saying, “Don’t speak evil against one another, brothers.” If one speaks evil it reveals what is already in his heart. Jesus said from out of our hearts come evil thoughts, murder, adultery, sexual immorality, theft, false witness, slander (Matthew 15:19). So, this is a call for Christians to treat one another with love because that shows the world we’re truly His disciples (John 13:34). However, due to the nature of their teachings, false teachers are not considered “brothers”. In other words, they’re unbelievers or non-Christians. Jude’s letter said the false teachers were headed for condemnation. Believers are not headed for condemnation (Romans 8:1). Perhaps the strongest words against false teachers are mentioned in 2 Peter 2, with verses 1-3 being very poignant. Again, very strong words about and against false teachers from Peter. In light of this characteristic of false teachers, James 4:11 is not referring to how we should treat unbelievers – the false teachers. James 4:11 is an exhortation for Christians not to slander one another. Certainly, calling someone a false teacher who fits the biblical description of one is not slanderous or evil. It’s a descriptive term that coincides with their actions. For example, if a man is characterized by stealing, he is a thief. That’s not a slanderous term, but a descriptive one based on objective evidence. The biggest issue with false teachers is that ultimately God is not glorified by their teaching. They are blaspheming the name of God when they teach things that are outright untrue about God for their gain. So just as Jesus, Paul, Peter and Jude warned people to beware of false teachers, we too can warn people about false teachers so they won’t be led astray and also so God can be truly glorified. May the Lord find us faithfully upholding His truth! What is catechism? What is catechesis? What does it mean to catechize? cat·e·chize [kat-i-kahyz]: to instruct orally by means of questions and answers, especially in Christian doctrine. What is the benefit of catechizing? What’s been the historical use of catechisms? To find out the answers to these questions and more, visit New City Catechism. These are the words to a popular song sung in many churches in response to an altar call. In fact, I grew up hearing this song sung often in the church I attended as a boy in Houston, Texas. These too are the words to a popular song sung in many churches. In like manner, I grew up singing this song too. It wasn’t until many years later that I discovered the significant differences each song communicates concerning salvation. It was also then I began to question the teachings of many songs under the Christian heading, whether songs of antiquity or of a contemporary nature. In addition to questioning songs, I also began questioning many popular church practices and seeing if they had any biblical basis. The aim in doing so was to siphon true doctrine and identify dross of unbiblical teachings and church routine. If it isn’t obvious already, each song communicates an active and a passive agent in salvation; or an initiator and a responder. What must be discerned is which agent is doing what and is that consistent with biblical soteriology or ordo salutis. In the first song, man is portrayed as the active agent or initiator in salvation and therefore God must be the passive agent or recipient of man’s decision. The second song pictures God as the active agent or initiator in saving man, making man the passive agent in salvation by receiving the mercy of a pardon and the grace of new life, adoption and spiritual sight. But which position is taught in Scripture? Assuming we believe in Sola Scriptura, then it is safe to say we can find our answer in the authoritative Word of God concerning this issue. Quoting several verses from Psalms and one from Isaiah, the Apostle Paul sums up man’s natural depraved position before God. And because of such radical depravity, man does not understand nor seek after God (v11) nor is there any natural reverence for God in man’s heart (v18). We must agree with the Scriptures when it tells us that our minds are depraved and because of that we naturally do not think rightly about God or ourselves. One of greatest forms of deception is to believe that we are in a better spiritual condition than we actually are. To disbelieve in the extent our sinfulness disables our ability to truly see and appreciate the magnitude of the grace of God in the accomplishments of Christ’s life, death, and resurrection. Again, the gospel (Christ crucified, etc.) is perceived as a stumbling block and foolishness to unbelievers. So if the gospel, which is a thing of the Spirit, is foolishness to natural man’s depraved mind, how can natural man on his own decide to follow Jesus? My contention is man cannot on his own see his own depravity before God and the beauty of Christ unless the Holy Spirit first does a work in man’s mind and heart to acknowledge the truth according to the foreknowledge of God. 39″This is the will of Him who sent Me, that of all that He has given Me I lose nothing, but raise it up on the last day. 44″No one can come to Me unless the Father who sent Me draws him; and I will raise him up on the last day. From these few verses spoken by Jesus, it is evident that salvation is not initially dependent on man, but on God’s sovereign choice. This is tough for some to come to terms with, but it is plain Scripture. But once it is accepted, we see grace for what it truly is. It was this grace that led John Newton to pen his famous hymn. Utterly rebellious and hopeless, the Lord sacrificed Himself for His sheep and upon hearing the gospel, we believed according to the plan of God. Indeed that is grace! So does man initially choose God or does God choose man? I think the answer is obvious. It is my sincere desire that we would be a people committed to correct doctrine and action for the sake of His glory and the manifestation of His kingdom.